An adult Pomarine Jaeger was soundly reported in the Cape May Rips this afternoon, along with 3 Parasitic Jaegers, which are the much more expected jaeger from shore. Dave La Puma and I were just perusing the weather forecast models (which conflict a bit). It looks like the current messy weather from successive low pressure systems won't clear out in time tonight to allow much landbird movement into southern NJ for Friday morning, thanks to rain and strong southerly winds. But, high pressure will move in Friday and solid northwest winds at 10-15 mph are forecast from Friday afternoon all the way through sundown Saturday!! Watch for Zugenruhe in your local patch Friday night, and Saturday will be one of the best days of fall. There certainly will be a substantial morning flight of songbirds, but that doesn't always translate into good viewing of warblers in trees at places like Higbee, Hidden Valley, the Beanery or Lily Lake. Things less inclined to fly out, like thrushes, sparrows and kinglets, should be common, and I bet the Northern Flicker show at Higbee Saturday will be worth the trip to Cape May all by itself. Peregrine Falcons should be in the 100's for the weekend, and it wouldn't surprise me if the former single day Peregrine record (298) falls. Sunday should also be excellent for Peregrines, with northeast winds generally the best for these notoriously over-water migrants. And finally, any weird southern thing that moved north of Cape May with these lows is going to be coming south this weekend, with the west winds to push it to the coast. Which reminds me. . .isn't it time for that White-tailed Kite in Connecticut to come south? 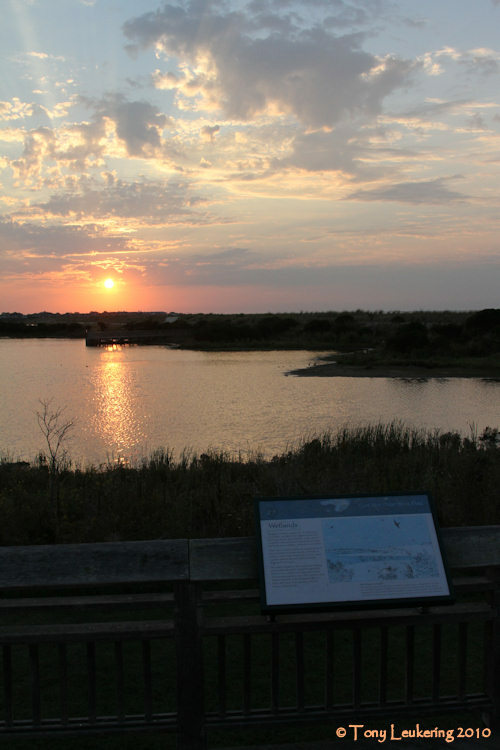 This is the Cape May Birding Hotline, a service of New Jersey Audubon Society's Cape May Bird Observatory. This week's message was prepared on Thursday, September 30, 2010. 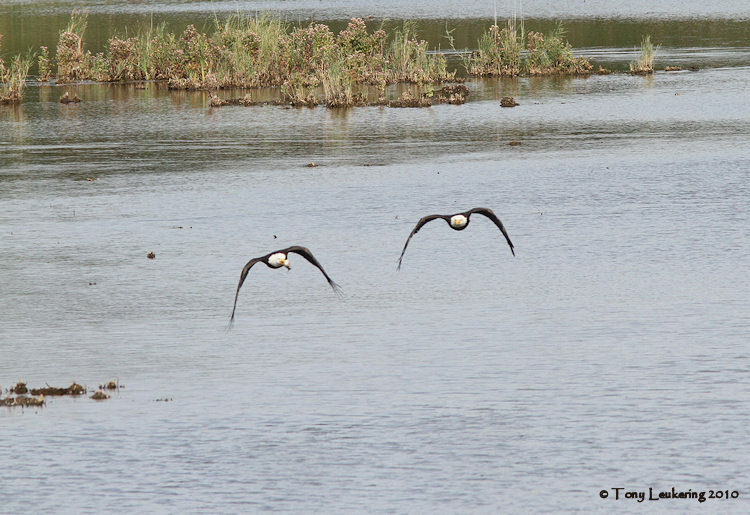 Highlights this week include sightings of BOOBY SP., LONG-BILLED CURLEW, SWAINSON’S WARBLER, WESTERN KINGBIRD, AMERICAN AVOCET, UPLAND SANDPIPER, BUFF-BREASTED SANDPIPER, DICKISSEL, CATTLE EGRET. 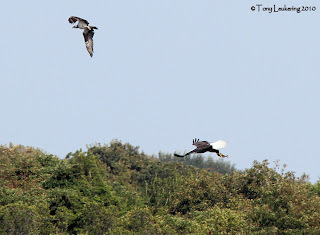 A BOOBY SPECIES (probably Brown) was seen flying past the Avalon Seawatch on Wednesday, September 29th, 2010. A LONG-BILLED CURLEW was heard flying over Beach and Patterson Ave. in Cape May City on Wednesday, September 29th, 2010, heading south. A SWAINSON’S WARBLER was banded near Cape May Point State Park on Sunday, September 26th, 2010. A WESTERN KINGBIRD flew by the Higbee Beach Dike on Sunday, September 26th, 2010. An AMERICAN AVOCET was found in Cape May Harbor near the Doxsee/Snow Calm Facility (Blue Tower), on Saturday, September 25th, 2010, and was visible from land from Ocean drive. Both UPLAND SANDPIPER and BUFF-BREASTED SANDPIPER were found at the Cape May County Airport on Thursday, September 30, 2010. Two DICKCISSELS were seen near the Cape May Point State Park Hawkwatch platform, with one there on Sunday, September 26th, 2010, and another on Wednesday, September 29, 2010. A CATTLE EGRET flew by the parking lot of the Cape May Point State Park on Wednesday, September 29th, 2010. Untitled from Doug Gochfeld on Vimeo. Brown Booby and Long-billed Curlew! Nope, not April Fool's or anything like that. Check out Doug Gochfeld's post on View from the Field from last night for the apparent Brown Booby, seen from the Avalon Seawatch. And if that's not enough, Tom Johnson and Steve Kolbe heard well and saw poorly a flyby Long-billed Curlew last night that apparently was headed due south over the ocean, as in looking to skip Delaware for points further south. A few birds were flying over in the predawn today (Wednesday), as this little front passed - I heard Chipping and Savannah Sparrows, Blackpoll and Yellow-rumped Warblers and American Redstarts migrating along Delaware Bay in pre-dawn, although only about a call a minute. Dave La Puma just told me the radar showed a late movement of birds, after the front made up its mind. And this just in - Tom Johnson reports a pretty special 5 Connecticut Warblers at Morning flight among 300 warblers so far, including 150 Northern Parulas, 70 Blackpolls, not to mention a Red-headed Woodpecker. Mike Crewe's Wednesday Morning walk at Cape May Point State Park found the continuing Dickcissel plus a Cattle Egret at the hawk watch this morning. The coming weekend still looks killer, although landbird movement on Friday seems like an "if" - it depends on how soon Thursday night the winds shift to northwest. Here's the recipe for a dream weekend in Cape May. 1. Timing: late September-early October, peak of autumn avian diversity. Peak Peregrine time. 2. The week before: lousy migration conditions, causing a significant backlog of birds wanting to go, e.g. a wet, windy tropical low coming up the Atlantic seaboard (which is what we've got). 3. 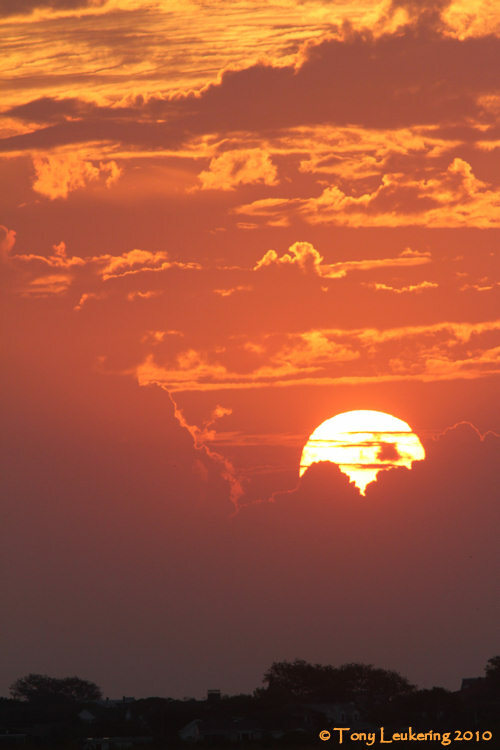 The night before: cold front clearing out in the afternoon or early in the night, setting up north northwest winds for the following night and day (s) (which is what is predicted). The upshot: Friday through Sunday look so good on the forecast maps it makes you shiver. 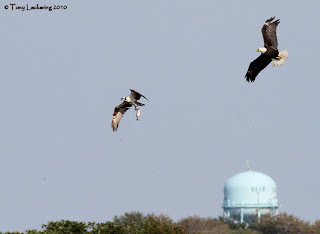 Just in time for our Cape May Birding Holiday workshop on Saturday - Sunday (still several spaces available). Or any of our walks. 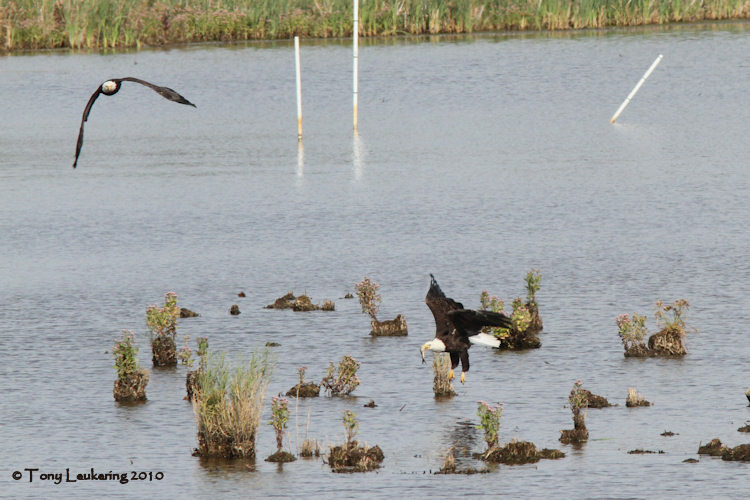 Or just hanging out on the hawkwatch platform watching raptors with CMBO's Interpretive Naturalists. Dramatic skies and occasional torrential downpours provided the backdrop for some great birds on CMBO's Meadows Walk this morning (Monday). 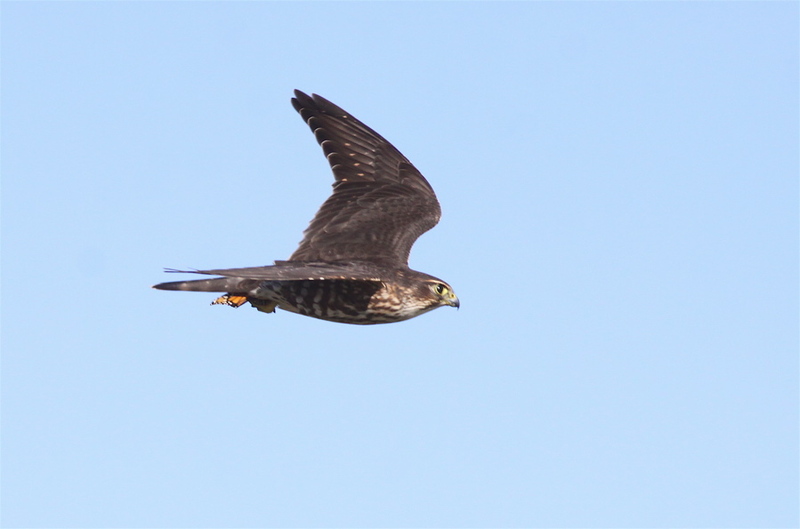 The Peregrine Falcon show was fairly steady, with birds hunting, floating on the dune updrafts, and perched on the sand. An adult Bald Eagle sat on the beach for a bit, and a fabulous adult Parasitic Jaeger flew literally right down the beach off the meadows; Doug Gochfeld also saw this bird from the hawkwatch. Three Clapper Rails were a bit of a surprise in the freshwater meadows, migrants and/or perhaps birds pushed out of the salt marshes by flood tides. A Sora whinnying in the meadows was more expected. The shorebird show was excellent, with many Wilson's Snipe plus Pectoral Sandpipers, both yellowlegs, a Stilt Sandpiper, and 3 Black-bellied Plovers. Savannah Sparrows were in along the meadows paths. An adult Lesser black-backed Gull was among the large gull and tern flock on the beach near 2nd Avenue in Cape May City, though it's a bit of a long reach to properly work that flock from the meadows, hopefully someone will check it thoroughly today. The full meadows list is up on field trip reports. Vince Elia and I were walking back along the dune trail at Cape May Point State Park yesterday and almost at the same time had the same thought. It was the Ruby-crowned Kinglet that triggered it, that and the Yellow-rumped Warblers, Palm Warblers and Eastern Phoebe, all later-fall migrants. The season turns, the migrant mix changes with the weather and like the foliage. I see Steve Kolbe counted over 1000 birds at the Avalon Seawatch yesterday - though over 800 of them were cormorants, ducks are a-coming. The crystal ball says maybe more migrants Wednesday, including a hawk flight thanks to forecast northwest winds during the day. Continuing the trend this year, next weekend is shaping up beautifully for some significant migration, just in time for our Cape May Birding Holiday Workshop. In the meantime I suspect many migrant landbirds remain around Cape May Point from yesterday's flight- try around Lily Lake or just walk the streets of the town. It will be absolutely flabbergasting if this bird is re-found, but a Swainson's Warbler was captured and banded near Cape May Point State Park today. More refindable would be the Western Kingbird that flew past the Higbee Beach WMA dike and turned eastward, seeming not to cross the canal. The strong warbler flight at the dike included many Northern Parulas & Black-throated Blues, as well as a few Tennessees, Nashvilles, at least one Connecticut, and of course plenty of Palms and Yellow-rumps. A White-throated Sparrow seeped from the base of the dike, my first of fall, and a couple Yellow-bellied Sapsuckers flew past. A Blue-headed Vireo at Higbee was another first-of-fall for me, though they have been found by others earlier this month. Both kinglets were seen both at Higbee and the state park. I hear the state park was pretty dead in the warbler department this morning, but Lily Lake was happening again, with multiple Cape May Warblers among those seen. Hawks scattered widely across the state park sky, which happily was cloudy (and less happily rainy later in the morning), among them Broad-wingeds, Merlins, Bald Eagles and Peregrines, the wheat among accipiter chaff, I guess you could say. A Dickcissel appeared in front of the hawkwatch platform, and a Yellow-billed Cuckoo posed for photos next to the parking lot. Michael O'Brien found virtually all of the first dozen or so, most of them in September and most of them in the town of Cape May Point, with many of those seen in large insect flights (dragonflies, butterflies) along the dunes with the Striped Saddlebags seen heading out across the Bay to the NW. 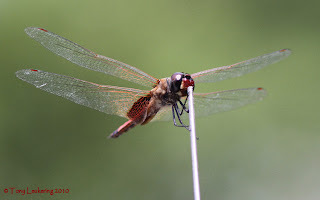 However, the rest of us interested enough to sort through the gobs of Carolina and Black saddlebags (T. lacerata) are catching onto their slightly different appearance. 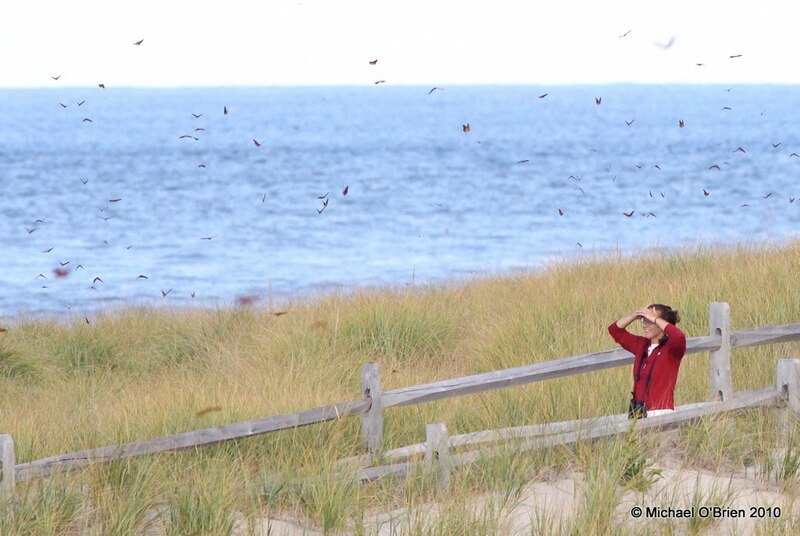 One very obliging individual posed for Doug Gochfeld and others on the Hawkwatch Platform in Cape May Point State Park yesterday and Doug snapped the first decent pictures of the species this fall that were not taken by Michael. Today, a group of us walking in the area around Lily Lake checking out the warbler show (Steve Bauer, a couple of visitors, and I) found at least seven (probably eight) of them. 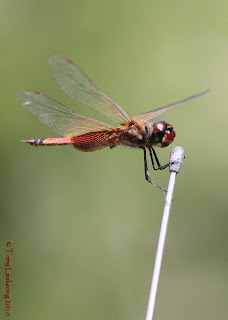 One of these, a young male, nicely posed on various car antennae right in front of the Northwood Center, allowing me to snap nearly full-frame pictures. 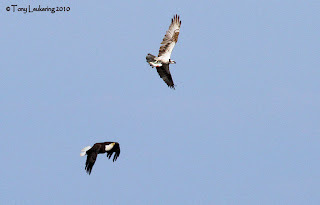 In the pictures below (the first two of the aforementioned young male Striped, the third of a male Carolina), note that young male (and all female) Striped Saddlebags sport two pale thoracic stripes (Carolina lacks them, as do adult male Stripeds), a more solidly black or dark brown tip to the abdomen, and differently-shaped "saddlebags." On Striped, the saddlebags are thin (from left to right), run parallel to the body, and are smooth-edged. The slightly larger but similar Carolina Saddlebags exhibits larger saddlebags (extending farther out toward the hindwing tip) with a decidedly jagged edge. Doug Gochfeld found an American Avocet in Cape May Harbor today, seen from the fish plants along Ocean Drive, feeding in shallow water. Bill Boyle made the long walk out to Stone Harbor Point this mornng, finding 5 Marbled Godwit, 300+ American Oystercatchers, and over 50 Caspian Terns. The good duck collection continues at the state park, and a Sora was ridiculously cooperative at Lighthouse Pond east, i.e. the one with the platform overlook along the red trail. Nothing more on the Black-bellied Whistling-ducks since last Sunday, apparently, but the King Eider continues at the Concrete Ship. By the way, the best place to see the eider, if it is actually on the ship, is from the end of Alexander Avenue in Cape May Point. So this front is supposed to pass Cape May shortly and stall, bringing northwest winds going to northeast by dawn Sunday. The wind won't shift to a north component until midnight or later, but that isn't so important - "our" birds, i.e. the birds that wind up in Cape May tomorrow, are already under north winds in northern NJ or beyond. Melissa counted a few Peregrines today, expect more tomorrow, double-digits. There will be more landbirds tomorrow too. I'm mildly curious about the possibility of the cold front stalling over Cape May, and what sort of bird accumulation that could cause if it happens. Nobody is forecasting that, and anyway it seems to be a "dry" front, i.e. it won't be raining to ground birds. A cold front is supposed to pass today, setting up winds going from northwest to northeast overnight. Sunday should be good, and the east component (and cloud cover) could make it a day for Peregrines from the hawk watch, though we are still pre-peregrine-peak-time. A HUDSONIAN GODWIT was discovered at Bunker Pond in the Cape May Point State Park on Saturday, September 18th, 2010. It was last seen there on Tuesday, September 21st, 2010. A presumed AMERICAN GOLDEN-PLOVER circled the Hawkwatch on Monday, September 20, 2010. 2 LESSER BLACK-BACKED GULLS were seen at two different locations on Monday, September 20th, 2010: an adult standing on the beach in front of the South Cape May Meadows, and a juvenile on the beach off of Cape Avenue. 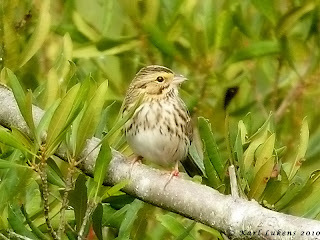 A CLAY-COLORED SPARROW was seen on the south side of Bunker Pond on Friday, September 17th, 2010. 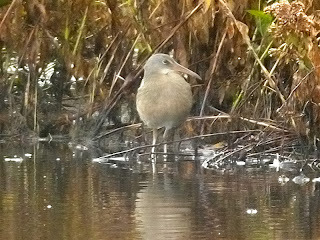 A LEAST BITTERN was seen at Lighthouse Pond on Saturday September 18th, 2010. Higbee Beach WMA was slow and thick with humidity and heat, but flocks of Northern Flickers and a Merlin livened things up, as did a group of titmice mobbing something in the second field "cove" - the indentation on the west side of the field. Flock catalysts that they are, the titmice soon had several warblers and a Yellow-billed Cuckoo nearby. I heard of an adult male Golden-winged Warbler and a Connecticut Warbler in the same area this morning, but our group did not detect them during the walk. As always, the full list is up on Field Trip Reports. Last night I circum-kayaked Nummy Island in the full moonlight (and don't miss Jupiter and its moons, easily visible in binoculars, even better in a scope), where, besides the night-herons and skimmers, a highlight was 35 Caspian Terns in a single flock over the base of the free bridge at dark, and at least 50 in the area generally. 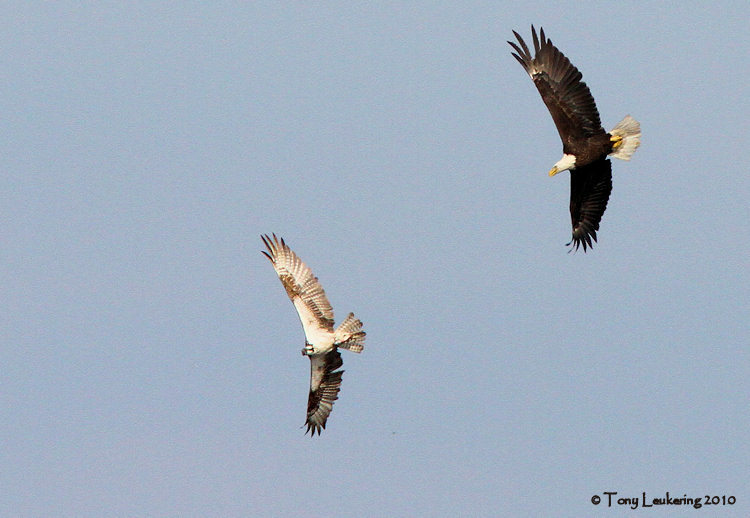 This site gets the largest numbers of this species in Cape May County. I hear several Marbled Godwits were on the flats at the free bridge at low tide yesterday. The free bridge, by the way, is the bridge over Great Channel just south of Stone Harbor - called "free" because, well, there's no toll on that one, as opposed to the one at the south side of Nummy Island leading to North Wildwood. This morning's CMBO Hidden Valley walk bagged both Connecticut Warbler and Yellow-billed Cuckoo, nice. Morning Flight at Higbee was slow and dominated by Blackpolls. The loose flock of 5 Red-breasted Nuthatches provided a bit of comic relief for the Morning Flight platform, slow and funny as they are. A sweet set of ducks floats on Cape May Point State Park's Lighthouse Pond of late, though the Black-bellied Whistling-ducks seem to have gone missing. Someone told me they were seen over last weekend, but I've heard no reports since. Nonetheless, multiples of Wood Ducks, American Wigeon, Gadwall, Northern Pintail, Northern Shoveler, and both teal make the place a nice challenge, what with most of the males still in eclipse plumage. We had stellar views of a Sora in Lighthouse Pond east, i.e. the one farther along the red trail with the observation platform. This Sora, and/or perhaps another one nearby, keeked several times. We had a group of 4 Black Scoters fly east off the Bunker, to which one can add more seawatch fodder in the form of the adult Northern Gannet that pumped south past Morning Flight at Higbee this morning. The Avalon Seawatch began yesterday, with Steve Kolbe as primary counter; click the link for more on the seawatch and the staff there. A mix of warblers continues in front of the Northwood Center, to the point where a small horde of birders accumulates there each afternoon. I saw Black-and-white, Blackpoll, Magnolia, redstart, and of course Yellow-rumped - all from the steps and without binoculars! I heard about Cape May and Tennessee there, too. So when's it going to break (the heat and south winds, I mean) and what should you do in the meantime? As to the latter, Stone Harbor/Nummy Island or the meadows offer good birding under any condition. As to the former, Sunday morning is shaping up to be a good one, at least in terms of migrant songbirds. The winds are forecast to go northeast, though, less good overall but good for Peregrines. A bit early for the big P-bird push, however. When in Cape May. . . Among the more interesting observations this morning (Tuesday) was the small flock of American Kestrels, very high over the lighthouse right at dawn, suggestive of nocturnal migration. Harriers, Merlins and of course Sharpies were everywhere around the point the first part of the morning. Our Birds and Trees Workshop found a Philadelphia Vireo along Lincoln in Cape May Point, and a Ruby-crowned Kinglet was among a mixed flock of warblers in front of the Northwood Center. Michael O'Brien had Clay-colored Sparrow, Dickcissel and Golden-crowned Kinglet near the old magnesite plant site. There was a decent morning flight of passerines et. 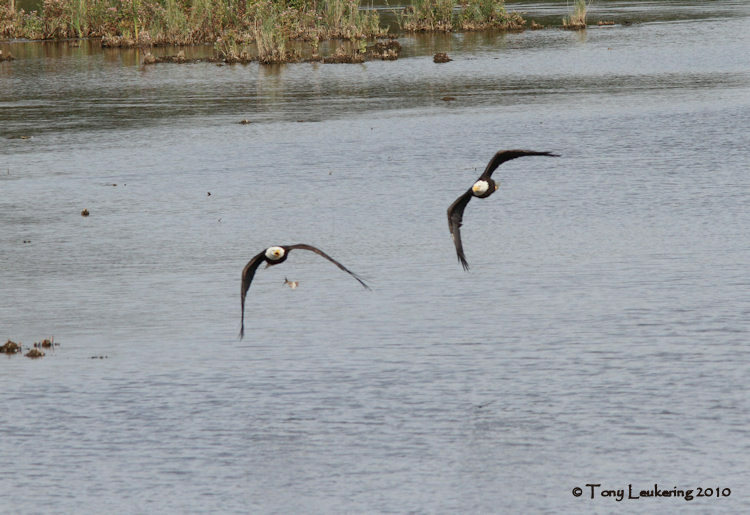 al, and it continued up the Bay - Tony Leukering counted 1035 Northern Flickers flying past Miami Beach in the Villas. Megan Crewe detected a Connecticut Warbler near the porta-johns at Higbee Beach. Signs of the advancing season, besides the two kinglet species, were Black Scoters moving - Tony had a couple flying down the bay and we had a string round Cape May Point. That, and the most common warbler in front of Northwood was. . .Yellow-rumped. Excellent shorebird diversity in the Meadows included an adult Long-billed Dowitcher, 2 Stilt Sandpipers, several each of Pectoral Sandpipers and Wilson's Snipe, plus the usual common species. Dave La Puma texted me that he had the King Eider at the concrete ship yesterday afternoon at 2:30 - matching the tide at that time would make sense if you go looking, rather the time of day, e.g. go about 3:20 today. The Hudsonian Godwit was back on Bunker Pond today, according to Karl Lukens. The Hudsonian Godwit, an adult well along to winter plumage and missing a foot, entertained folks on the hawkwatch most of the day today (Monday) as it fed in Bunker Pond, but eventually lifted off and flew to the South Cape May Meadows. The hawkwatch also spotted an American (presumed) Golden-plover in a flock of Black-bellied - that bird also seemed to wind up in the meadows. Michael O'Brien had a juvenile Lesser Black-backed Gull on the beach off Cape Avenue, a nice plumage to see. An excellent hawk flight included an exceptional afternoon falcon flight, look for details on View from the Field soon. Tom Reed made interesting observations of the best American Kestrel flight he's had at Reed's Beach, up the bayshore: 100 flying north along the bayshore between 5:45 and 6:45 p.m. These undoubtedly are birds that Doug counted at the hawkwatch in Cape May, diverting north along the bay to find a narrower place to cross. 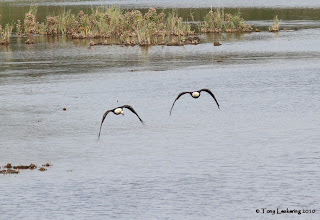 I didn't hear about the Black-bellied Whistling Ducks today, nor about the King Eider. A few warblers, with nice diversity, were outside the Northwood Center along East Lake Drive in Cape May, according to Mike Crewe. Light north winds are forecast overnight and into the morning tomorrow. The radar and anecdotal reports indicate a good flight of birds descended to our north last night. . .will they continue tonight and arrive tomorrow? It should be great conditions throughout the region for nocturnal listening. And finally, Monarchs, Monarchs everywhere, still. 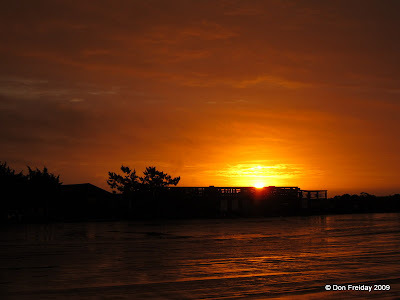 Don's post on this morning's Monarch flight was matchless; no text, just three pictures which magically summed up the sheer pleasure of being on the dune crossovers at Cape May Point this morning. Well, I'm famous for being more verbose, so here's a summing up (mostly in pictures!) of this weekend's stunning spectacle. We knew they were coming; we all knew they were coming, but we could have no idea just how many Monarchs would be at Cape May Point by Saturday evening. It all started with a wonderful flight of Monarchs, all drifting south to the point, then west along the dunes. By Saturday lunchtime, reports of 'roosts' were reaching the Hawkwatch Platform. In fact, these were insects gathering at rich food sources which, at this time of the year, often means Common Ivy - a plant which bears flowers in fall and fruit in late winter. ...and eventually even to the bare branches of a stand of White Poplars. 06:30 Sunday morning saw people gathering in Stites Avenue again and even as the first light cut across the point, butterflies were getting restless and were itching to get going. 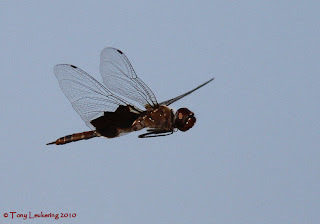 By 07:00 the sun was hitting the tree tops and wings were beginning to vibrate as flight muscles were warmed. Ever more and more butterflies worked their way into the sun to get warm and ready for flight. The start of the big lift was not far away as the vanguard tested the air currents. The moment before lift off, with most of the Monarchs now fanning their wings. Wondering what the tree is by the way? Well, with such a heavenly sight it can surely only be one thing - yes, it really is Ailanthus altissima, the Tree of Heaven. With the roosts now up in the air, the dune crossover was the place to be, as butterflies tested the air currents and waited for the right moment. I call this picture simply "Look Mark, a Monarch!" Traditional passtimes continued on the beach, but what a morning to be there! After some pretty amazing point counts, when Tom Johnson did a quick 360 degree estimate of 5200 butterflies passing Higbee Dike and Monarchs were passing along the beach at Coral Avenue at a steady 700 per minute, the main event suddenly happened right before our very eyes. At around 08:00 the wind shifted a little, from roughly Northwest to Northeast. I felt the change on the back of my neck and at the very same moment Monarchs just happened. That sums it up for me - Monarchs happened! 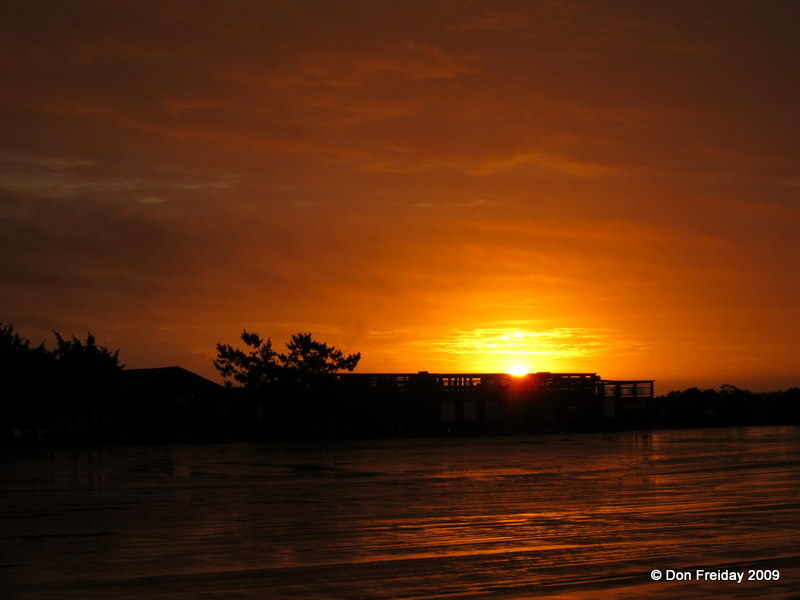 An uncountable mass of black and orange simply left New Jersey and headed out across Delaware Bay. How many? We'll never know, but figure on 100,000 butterflies - then add on all the ones around the corner! That's it. Just time to add that the comments uttered at the time were all part of the occasion; Michael O'Brien: "No rarity is better than a migration event". Vince Elia: "I'm so speechless, I can't stop talking!". And I know that Vince was speechless because I heard him telling everyone! The main event today (Saturday), perhaps the main event of the season, was the Monarch butterfly flight. It would not be unreasonable to say more than one half MILLION Monarchs passed through Cape May Point today, and many are still there right now, roosting in sheltered spots after nectaring on native sunflowers and seaside goldenrod, as well as butterfly gardens throughout Cape May Point. Counting sometimes yielded 200 migrating Monarchs a minute - that's better than 3 a second - and that was just insects traveling down the dunes. Jenny Howard, our Monarch Naturalist, has more on today's epic flight on View from the Field. Birds. A decent warbler flight included a cooperative Cape May Warbler in the fields at Higbee, amidst 15+ species for my party and surely more overall, though things quieted down quickly there. 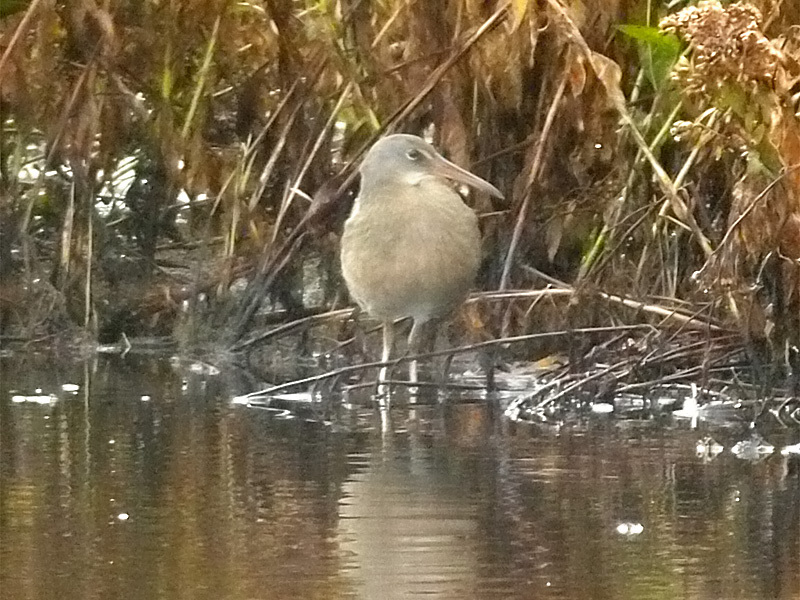 Marsh birds made for bigger headlines, including a Least Bittern in Lighthouse Pond first reported by Tom Johnson not far from the bird blind. Mike Crewe later saw a Sora walk past the bittern. 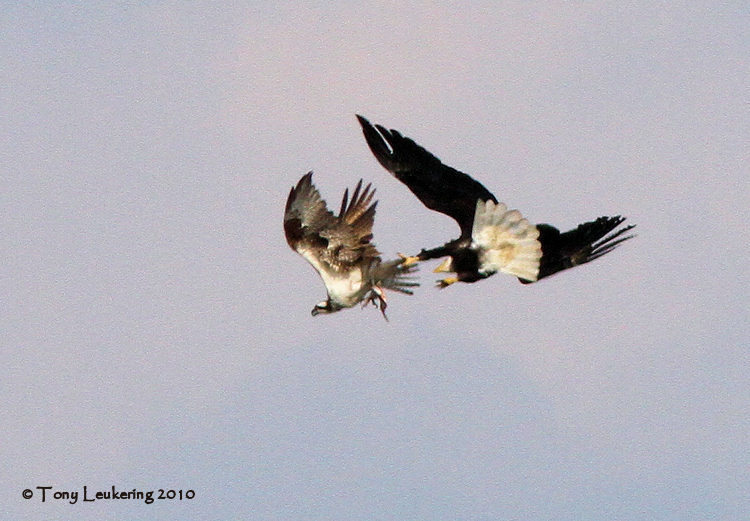 The hawk flight was good too, over 1,000 birds, but . . . Winds are forecast to be very light out of the east tonight, and light north-northwest-northeast tomorrow, with clear skies. Neither optimal nor bad overnight, and certainly very good for listening. Tomorrow should feature more songbirds, high hawks and monarchs. 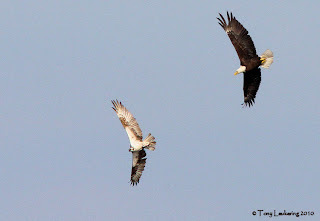 What's good... er, bad for the goose...er, Osprey... might also be good... er, bad for the gander... er, Bald Eagle! This afternoon during a nice-but-distant-and-high raptor flight, one of the resident Bald Eagles -- the one with the missing 7th primary on the left wing -- was seen to chase a few fish-laden Ospreys around. 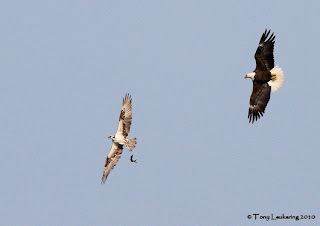 It was obviously trying to be helpful and unburden said Ospreys, thus alleviating the Osprey of the energy-expensive process of carrying those large fish from the Bay to some pole or snag on land. It chased one Osprey out over Cape May and that Osprey put one good move on the eagle and the latter gave it up for a lost cause. However, not very many minutes later, the action started up much closer to the Hawkwatch platform, and the many photographers on deck went to town, spending phosphors like they were water (or some such metaphor). ... with the eagle swooping down to grab it. 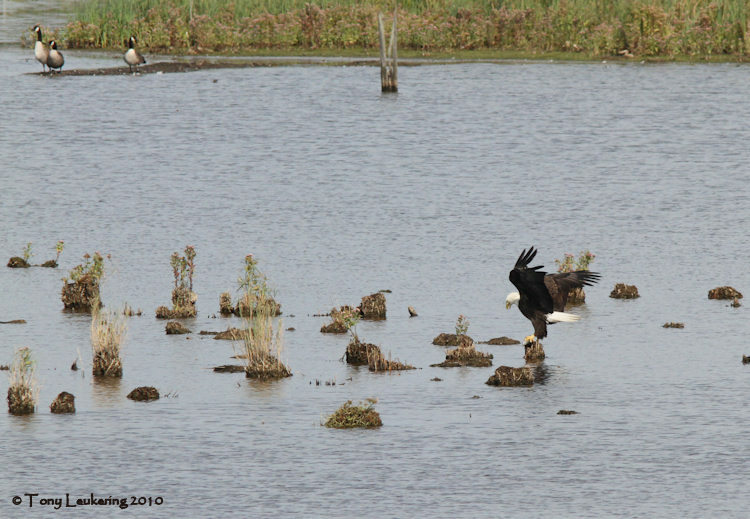 The eagle then dropped down onto one of the hummocks in Bunker Pond for a quick snack of fish and chips (minus the chips). The Bald Eagle had managed to down a fair portion of the fish in a few gulps, when sharp-eyed observers on the platform noticed a new player entering the field. It seems that our kleptoparasite was about to feel the sting of payback. ... was dropped into Bunker Pond to, as they say and I just couldn't resist, feed the fishes. Meet CMBO's Fall 2010 Migration Count Staff! Of Higbee's, Gulls and Pseudo Monarchs!